On January 25, a diverse group of woman speakers and panelists—with backgrounds ranging from law to consulting to the Broadway stage—came together at Fordham Law to discuss how to succeed as a woman in law, touching upon topics such as resilience, body language in the courtroom, and the #MeToo movement. 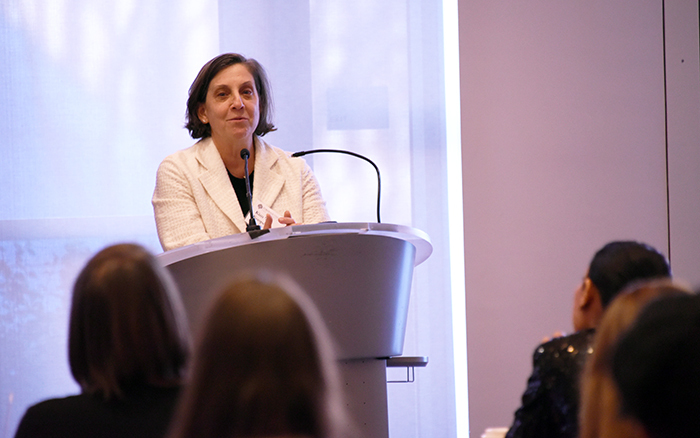 The second annual Women’s Leadership Institute at Fordham Law commenced with remarks by Dean Matthew Diller followed by a presentation on stress and burnout prevention from Paula Davis-Laack, CEO of the Stress & Resilience Institute. Fordham Law Professor Emerita Maria L. Marcus was presented with an award for her decades of service as a legal educator. After an introduction of Professor Marcus from 3L Miyoshie Lamothe-Aime, the Skadden Conference Center audience was treated to a video tribute to Marcus. Featuring testimonials from her former students, the video emphasized Marcus’ inspiring brand of teaching and the profound impact she continues to have on students who had her as a professor years ago. In her speech accepting the award, Professor Marcus spoke about her days as a student at Yale Law in the 1950s. It was a time, Marcus noted, when women were seen as biologically predisposed against practicing law. Marcus even had a professor who predicted that the numbers of women in law school would never move beyond five percent of the student body. Kim Koopersmith ’84 delivered the keynote address, speaking about the challenges she faced as a woman moving her way up the career ladder. Koopersmith is currently chairperson of Akin Gump Strauss Hauer & Feld LLP. She is one of the few women to chair a firm listed in The American Lawyer’s Top 100 law firms. Early in her time as chairperson, Koopersmith recalled, when people would ask her about her job, she would simply say, “I’m at Akin Gump.” Since then, she has taken a different, more direct approach. “I reflected years later on,” she said, “Why don’t I just say ‘I run Akin Gump’? Why do I say ‘I’m at Akin Gump,’ and wait for someone to ask me what my job is there?” It is perfectly fine, Koopersmith stressed, for women to be proud of their accomplishments and their ambition. Following a presentation on public speaking and projecting credibility from Brenne Grossman, Broadway actor and principal trainer at SpeechSkills, panelists gathered to discuss building professional networks, maintaining work-life balance, and a plethora of other issues. Khadijah Sharif-Drinkard ’97, senior vice president of business and legal affairs at Viacom Media Networks and the panel’s moderator, began by asking the panelists what contributed to their success in the legal world. Aviva O. Will ’95, senior managing director at Burford Capital, echoed Koopersmith’s address by encouraging young women lawyers to be bolder—a clear aspect of her own success. “You don’t have to start everything with, ‘I’m sorry, but’,” she said. Sharif-Drinkard offered her own advice as well, noting that flexibility, especially “not being afraid to take on more responsibility,” is a recipe for success in law. Other panelists included Christa D’Alimonte, general counsel of Viacom and Jiyeon Lee-Lim, partner at Latham & Watkins LLP. The conference concluded with a fireside chat between Hon. Claire Chadirjian Cecchi ’89 and Brittany Dryer ’16. The conference was sponsored by Fordham Law’s Feerick Center Social Justice and the Stein Center for Law and Ethics, as well as Akin Gump Strauss Hauer & Feld LLP, Latham & Watkins LLP, and Cahill Gordon & Reindell LLP. 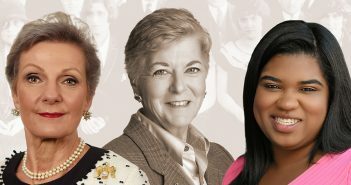 The event is part of the School’s yearlong celebration of 100 Years of Women at Fordham Law.